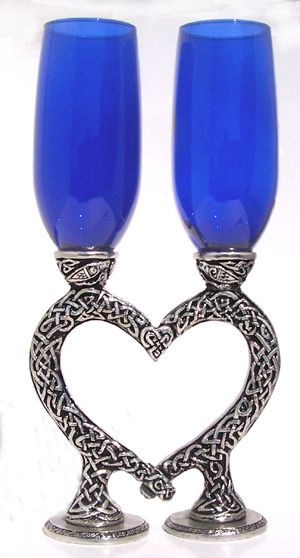 Richly detailed Celtic ornamentation covers the entire stem area of these toasting glasses. Looking carefully you'll see the "love birds" in the design. When the two glasses are placed together they form a heart. We make them by hand from lead-free pewter and fine glass. Sold as a pair, they each hold 8 ounces. * For our life-long GLASS REAPAIR GUARANTEE go to "Cleaning & Glass Repair" near the top of our home-page. ** To see GLASS COLORS click on the "Color Chart" at the bottom of this page.